Some big news out of a small package. 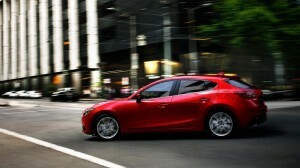 The 2014 Mazda3 is the maker's newest model to use Skyactive technology and the Kodo design language. It might not come as a complete surprise considering the number of recent leaks emerging from inside Mazda, but the first official images of the new Mazda3 nonetheless live up to expectations as the maker rolls out its latest Skyacti model. The 2014 Mazda3 also becomes the latest in the Japanese maker’s line-up to adopt the new Kodo, or Soul of Motion, design language, following such recent entries as the Mazda6 sedan and CX-5 crossover. That includes the oversized grille – which conceals wind-cheating grille shutters — headlamps that flow back over the front fenders, and subtle sculpting of the side panels. The profile gives the hatchback an almost coupe-like curvaceousness. Maintain Your Love Affair with the Automobile! The 2014 Mazda3 adopts a 2.4-inch longer wheelbase than the outgoing model but it’s actually two inches shorter, nose-to-tail. Meanwhile, those active grille shutters help deliver a claimed best-in-class drag coefficient of just 0.255. The new hatchback reportedly weighs in about 200 pounds lighter than the old model, in part due to a focus on so-called lightweighting – one of the key elements in the maker’s Skyactiv strategy. Nonetheless, by switching to high- and ultra-high-strength steel in key locations the new model also is 30% stiffer, Mazda notes. Mazda will reveal the new 2014 Mazda3 sedan later this summer. Both will reach showrooms in autumn. How all these numbers compare with the sedan version Mazda will unveil in a few weeks, well, we’ll have to wait to find out. The interior, meanwhile, benefits most from the added wheelbase, delivering a fair bit more room than the old, rather cramped Mazda3. The materials have been refined but what may be most intriguing to potential buyers is the Active Driving Display, an all-new human-machine interface designed to deliver key driving information, such as vehicle speed and navigation turn-by-turn directions – in your line of sight through a new head-up display. 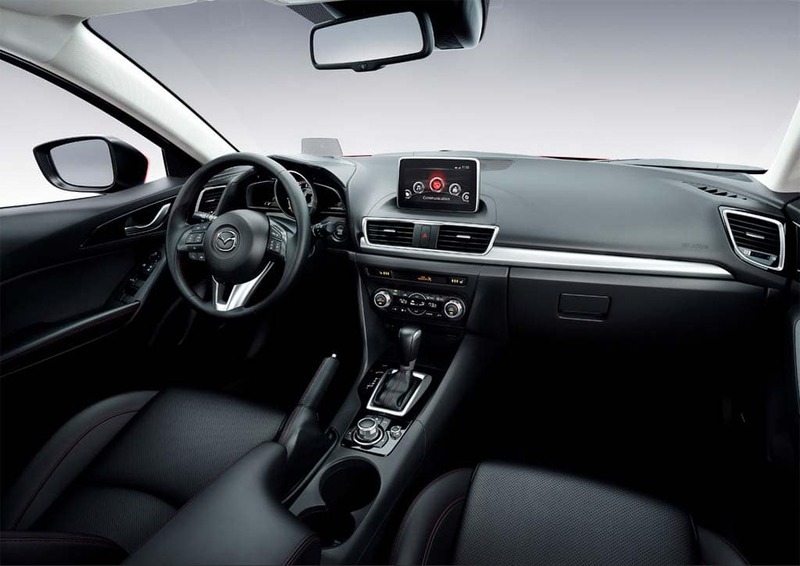 Mazda also boasts the infotainment system has been completely redesigned. The Japanese maker will offer a wide range of engines in various markets. There’ll be just two for the U.S., though, and for now, at least, that doesn’t include the new Mazda diesel. Instead, buyers will be offered the base 2.0-liter Skyactive-G making 155 horsepower and 150 lb-ft of torque. The upgrade comes in the form of the 2.5-liter Skyactiv-G that bumps the numbers up to 184 hp and 185 lb-ft. 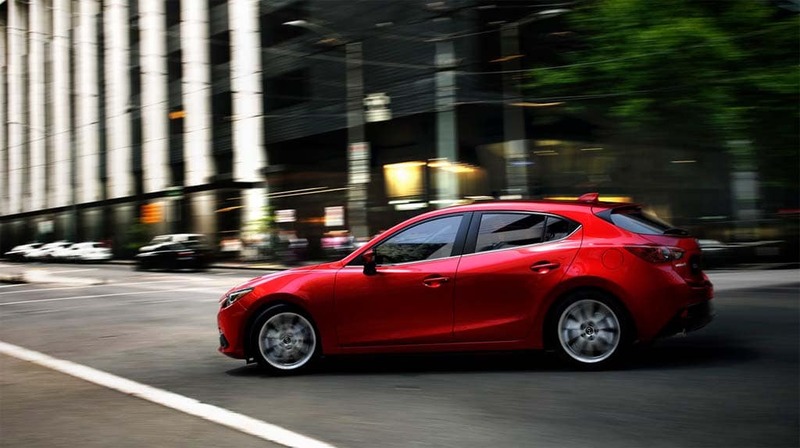 The 2014 Mazda3 features a new head-up display system and a redesigned infotainment system. Both can be paired with either a 6-speed automatic or a 6-speed stick. The 2014 Mazda3 also will become the first vehicle to use the maker’s new i-ELOOP system. It’s what you might call a very mild hybrid that uses regenerative braking to recapture energy lost during braking. But that energy is stored in an ultracapacitor, rather than a battery. And instead of powering an electric motor to boost acceleration, the ultracapacitor can take the load off the Mazda3’s generator by taking over the car’s electronics systems. 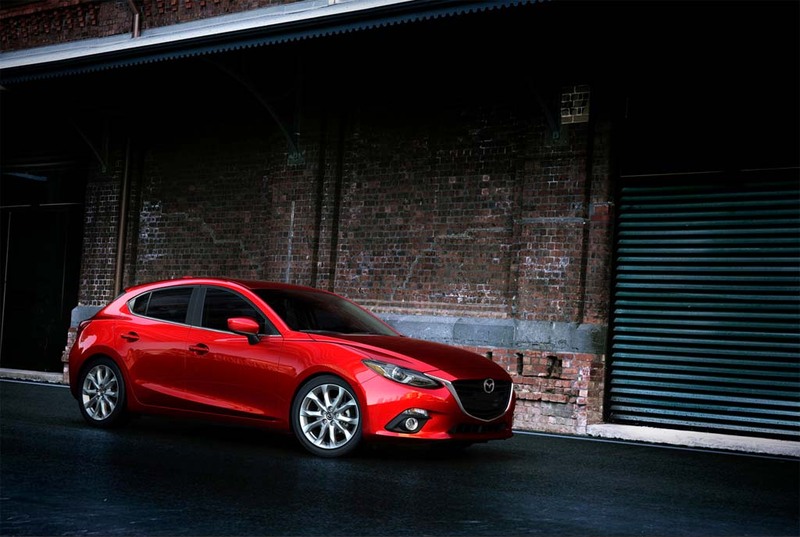 Look for the new 2014 Mazda3 to reach U.S. showrooms around September. Early versions will be shipped in from Japan, but the maker plans to switch production next year to and all-new plant in Mexico. Mazda walked away from its only U.S. assembly line, which was shared with Ford and produced the bigger Mazda6, last year. Look for pricing information closer to the line’s autumn launch. This entry was posted on Wednesday, June 26th, 2013 at and is filed under Automobiles. You can follow any responses to this entry through the RSS 2.0 feed. Both comments and pings are currently closed.